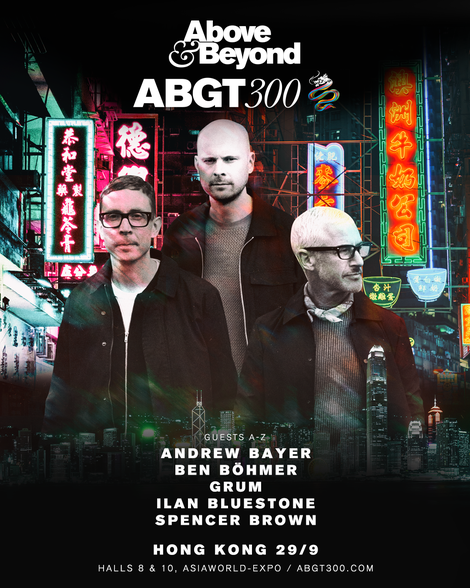 On Saturday 29 September in Hong Kong’s AsiaWorld-Expo centre, Above & Beyond will celebrate 300 episodes of their radio show, Group Therapy. The band recently announced a lineup of guests showcasing talent from their Anjunabeats and Anjunadeep imprints. Joining the trio, named in alphabetical order, will be Andrew Bayer, Ben Böhmer, Grum, ilan Bluestone and Spencer Brown. Andrew Bayer was recently described by Pitchfork as “one of America’s biggest trance artists.” Possibly known for his artist albums, his imminent third album ‘In My Last Life’ is regarded by his label bosses Above & Beyond as he defining work to date - with eight songs delivered by his collaborators Ane Brun and Alison May. In the first six months of this year, Germany’s Ben Böhmer has released two EPs, remixed Above & Beyond and Way Out West and clocked an ‘Essential New Tune’ nod from Pete Tong on Radio 1. Representing Scotland, Graeme Shepherd, a.k.a Grum, got the nod to join Above & Beyond for ABGT200 in Amsterdam. Since then, he’s dropped a slew of slow-burning, progressive cuts on Anjunabeats including ‘Shout’ and ‘Price Of Love’ plus his compilation, ‘Anjunabeats Worldwide 07’. San Francisco’s Spencer Brown will cap off a watershed year at Group Therapy 300. Above & Beyond discovered Spencer through his 2014 ‘Chalice EP’ on Avicii’s LE7ELS. A string of EPs on their Anjunabeats label followed, culminating in the recent release of his debut album ‘Illusion Of Perfection’. Later on in the year, look out too for their appearance at SWG3 in Glasgow, UK on Saturday 3 November as part of their Common Ground Tour.